The autumn is here and its time from a new series of deals and offers as well as a new free item in all orders placed too. We had excellent feedback on the last offers and we took comments on board. So most of this month's offers are based on feedback. If you have something of ours in mind and would like to suggest we make a deal on next month just drop me a line and ask. You never know. Read on! Here are our new deals and offers for the next month or so. These can all be found on our website offers page. 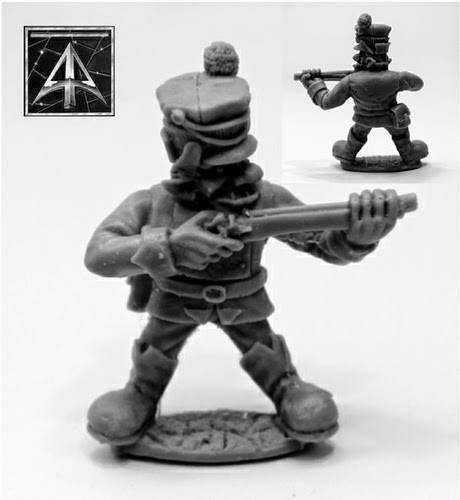 59000 The Armourers Pack (32 Random Muskets) is 25% off meaning you can convert or add to your Flintloque forces with ease. From the classic Asgard Barbarians Range we have an extra saving on the BP13 Barbarian Warband giving you 15% off a set of twelve 28mm characters for any fantasy system. In gunnery terms for fans of Slaughterloo and Flintloque we have a superb half price offer on the 59501 Grand Alliance Artillery Set (three cannons and two limber sets). For personalities we have 15% off the great 51507 Elf Command Set for fans of the tyrant Emperor Mordred. Our popular boxed set 5104 105th Rifles with 18 different Orcs in it is also 15% off so if you want to get some back up for Captain Sharke and his Rifleorc's this is your time. Lastly by request we have an offer of 25% off the VNT1 Eternal Guard skeletons pack of five fantasy miniatures re-released under Project Darkhelm. Excellent! Free in all orders from today, taking over from the resin riding pig, is another brand new conversion to resin for Alternative Armies; 56563 Trolka Jager firing. It is our intention to convert the entire 28mm range of massive Trolka infantry away from white metal and into resin instead. This will mean a price reduction and it starts with quite a reduction. That being one free Trolka Jager in every order automatically. A wee gift worth 5.00GBP which you can also purchase more of it you desire. So 56563 Trolka Jager firing free in every order and on general release at a lower price too. Superb! This entry was posted on Monday, September 15th, 2014 at 16:23 and is filed under News. You can follow any responses to this entry through the RSS 2.0 feed. You can leave a response, or trackback from your own site.